I first encountered Stanley Villavicencio seven years ago when he spoke at our parish, the Presentation of the Child Jesus in BF Homes Parañaque. This spurred me to write an article on him (page 19). But I was not able to speak personally with him and the ensuing years, I tried several times to get an appointment but failed. Stanley has a busy schedule – locally and internationally – that as of September 2011, I was told that his schedule is full until June 2013. He has brought his testimony on Jesus, the Divine Mercy to so many countries in Europe, in the U.S. and even to non-Christian nations like Thailand. Several weeks ago, I received a text invitation to attend a talk given by Stanley, and the veneration of the image of Jesus the Divine Mercy in a private place. I overjoyed at the opportunity especially when I was granted an interview before his talk. It is such a privilege to talk to somebody with whom the Lord Jesus has opened communication lines. Up close, 57-year-old Stanley is like everybody’s favorite uncle. He is humble and soft-spoken. Speaking in a mixture of English and Tagalog with a slight Cebuano accent, he is not the type of speaker who impresses with his theological background. The person on whom God has entrusted the mission of spreading His Divine Mercy strikes you with his simplicity. And yet one glimpses the wisdom in his words. Can you tell us about your travels around the world spreading the Divine Mercy? Is Jesus happy with the propagation of the Divine Mercy? Yes, He is. It is being accepted even by non-Catholics. In Thailand where I gave my testimony, 60% were Buddhists and they embraced the devotion. Well, the Buddhists believe in God also! In the U.S., some Baptists, Lutherans, Anglicans, and Orthodox Christians embraced the devotion. One Divine Mercy Coordinator in the U.S., particularly in Michigan, is the Archbishop of the Greek Orthodox Church, Abbot Martin Deporres. What would Jesus’ principal message be to us now? Perseverance in prayer because matindi ang laban (the fight is fierce). Without prayer, we cannot survive. Our motto in praying therefore should be “No retreat! No surrender!” Jesus said that to all problems, there is only one solution: prayer. But it should be quality prayer – prayer from the heart, not simply with the lips. Have there been miracles during your talks? Oh yes, especially during or after the veneration of the image of Jesus, the Divine Mercy. I am not allowed by Cardinal Vidal (of Cebu) to pray over a person. It is Jesus who heals so after my talk, there is the veneration of Jesus, the Divine Mercy. In Australia last February, there was this girl whose cancer had spread to her brain, who could not walk, and was given one week to live. After the veneration, she was walking, jumping, and praising God! How does one invite you for a talk? You have to write Cardinal Vidal. I give a monthly report to him. I am under the umbrella of the Church. My spiritual director is Msgr. Cris Garcia. He has the gift of internal locution and is aware when Jesus communicates to me. How are your travels around the world made possible? Do you have an organization to handle things? I don’t have an organizational structure. I am just a witness. It is Jesus who arranges everything. But in the U.S., for example, there are Divine Mercy Coordinators in almost all the states. How does Jesus communicate with you? I had a covenant with Him that He communicates to me through dreams. I have had 36 encounters with Him in my dreams. But He guides me everyday through interior locutions. He is taller than me (Stanley is around 5’8” in height – ed. ), slim, very handsome. He has blue eyes, a pinkish complexion and when He smiles, He has dimples. His hair, from afar, seems blonde but this is just because of the reflection of light around Him. When He is nearer, His hair is black and wavy. He is more polite than me. He always says “thank you” and “please”. How humble is the Lord! Have you had an encounter with Mother Mary? It started this way… When I was going out of our house in Cebu, I felt Our Lady telling me, “Eh, ako?” (How about me?) So, I went back, got the image, and from now on, I always bring together the images of Jesus the Divine Mercy and Our Lady of Guadalupe. In Japan, the half-closed eyes of Our Lady of Guadalupe opened before the TV cameras, and many cried. In L.A., sometime in 2008, this also happened and the people also cried. What is your family’s reaction to all your activities and travels for the Lord? My wife, Melissa, and my 13 children are all my prayer warriors. I told the Lord that He should use my entire family. There was an accident involving my son and his companions. Their car lost its brakes and fell down a cliff – the drop was more than 300 meters. My son’s companions died, all mutilated. My son survived, without the slightest injury. He told us that when the car was falling down, he felt a cold wind embracing him. I think that is the Holy Spirit. My son was saved as a fruit of prayers. You are a lucky and blessed person! I have nothing to be proud of except for my sins. I asked the Lord, “My Lord, my God, why me? I am a sinner, a sinful man, and there are so many much more worthy than me.” Jesus answered, “You cannot appreciate the beauty of My Mercy unless you experience the misery of sin.” So I accepted my mission. 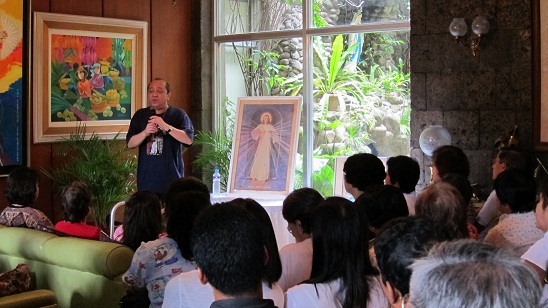 Click here to return from Interview with Stanley Villavicencio to Divine Mercy.